The development and valorisation of people’s skills represent fundamental strategic levers supporting the growth of the Group’s business. The development and valorisation of people’s skills represent fundamental strategic levers supporting the growth of the Group’s business and are based on a meritocratic logic, in observance of corporate values and the leadership model broken down into all organisational levels. The development goal in Poste Italiane is to build a virtuous company in which everyone is able to access a path to professional enrichment, skill and experience. The Company offers fair and transparent instruments and methodologies which consider, in their application, the heterogeneity of various segments of business and function. The development of people in Poste Italiane is managed by means of an integrated model aimed at valorising the merit and growth of human capital during the entire professional lifecycle. The architecture of the model takes form from the wider lines of People Strategy which define the contribution of the Human Resources and Organisation function to the implementation of the Strategic Plan. The strategy is conceived and structured in order to lay down the phases of the development process over bearing axes, transversal to the entire corporate population. The mission is precisely that of sustaining business growth by means of valorising human capital, capturing its potential, developing its talent, sustaining the motivation thereof and consolidating its experience by means of growth opportunities. development: aimed at sustaining individual growth of resources with potential and accelerating their development. The Development System is strongly integrated with Change Management activities that affect corporate culture and collective aptitudes. Map the talent resource base and plan its development in relation to the different level of readiness/availability on target positions. The characteristics and criteria of access to scouting processes foreseen in Poste Italiane are specific and differentiated in relation to the target population and level of professional maturity expressed by the participants. Assessment of Management Potential (MLAB), intended for the professionally more mature corporate population and aimed at identifying key persons - so-called key talent – to cover middle management roles. ​Leadership Assessment, dedicated to expert managers and aimed at identifying possible successors, or leaders, for the Group’s key positions. There is another type of assessment in the scouting processes which is Skill UP, aimed at mapping and/or certifying technical-specialist skills in the Company and the degree of role coverage. Such assessment involves the Company in a transversal manner, addressing specific professional families. The activity involved 468 resources in the context of 33 Individual Business Coaching paths dedicated to managers under development. In the moment of synthesis between the potential of people and corporate necessity, Poste Italiane periodically manages the process of management planning by means of Review meetings between the Human Resources and Organisation function and the Function Managers. Succession Planning, dedicated to second and third level managers and aimed at intercepting persons with development potential towards organisational level one target roles. Development actions are a whole of interventions, articulated and coordinated, which allow people to be accompanied in their growth in relation to corporate necessities on the basis of evidence of scouting and planning processes. In this context, during 2017 coaching and mentoring courses were activated and planned in order to develop soft skills and leadership. Furthermore, a programme was launched dedicated to innovation built on the Hackathon format (innovation marathon) by means of two pilot projects (Poste Innovation Storm), which involved 100 corporate talents in the proposition of innovative lines linked to priority business challenges. 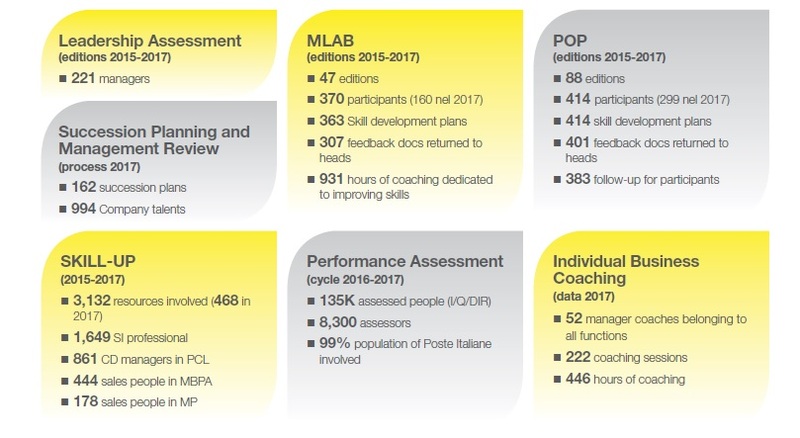 In late 2000, Poste Italiane implemented a Performance Assessment Process (VdP) which represents one of the main instruments supporting management, development and personnel training policies. Over the years the number of assessed people increased constantly until, in the latest assessment campaign (which ended in April 2017) it reached almost all the corporate population, with a 4% increase compared to the previous year. 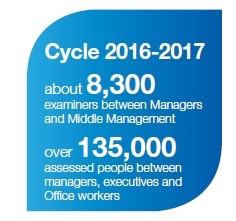 During cycle 2016-2017 about 8,300 assessors were registered, between managers and middle management and over 135,000 assessed subjects between managers, office workers and executives. 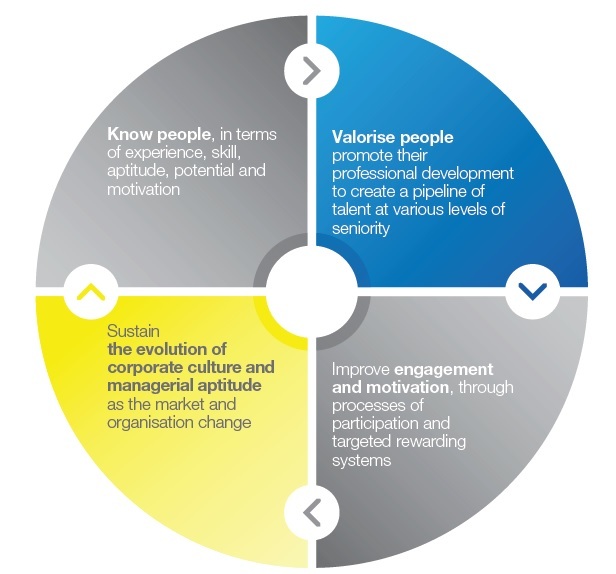 In 2017 the Performance Assessment model was reviewed according to certain evolutionary principles leading to better consistency with the corporate vision and Group strategy, such as to render the process a key instrument for the development of people. Shown below are the main drivers to guide the evolution of the Poste Italiane VdP system. Shown below are the main drivers to guide the evolution of the Poste Italiane VdP system. aimed at valorising excellence, developing the culture of assessment. cascading and functional cascading logic. and usability of the model. 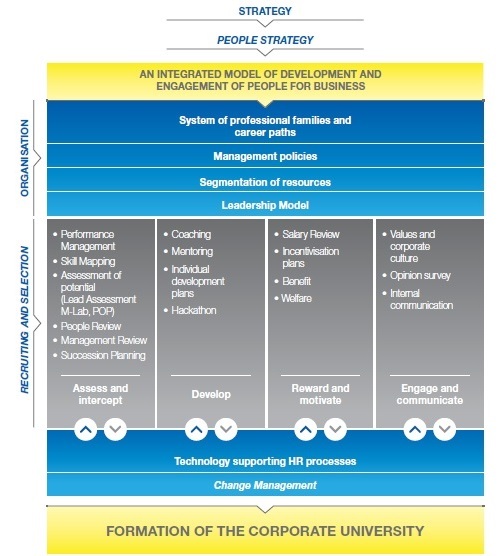 Moreover, once again in the context of performance assessment, in 2017 an “expanded pilot assessment” was launched (180° assessment), which involved the Group Executives and about 200 1st and 2nd organisational level managers in order to gather the various opinions on the resource and divulge the effective managerial conduct. The assessment, expressed by peers selected according to the main organisational relations existing between them, took place online through a dedicated SDM (Succession and Development Management) system. Alignment with medium/long term strategies of the Company. Short term variable remuneration has the purpose of reinforcing the attention to the creation of value, consistently with corporate strategy and budget, connecting the issue of annual bonuses for effectively achieved performances during the year of reference. For financial year 2017 the objectives subject matter of incentivisation for beneficiaries were: economic-financial, customer experience and function. Long term variable remuneration has the purpose of focussing the attention of resources on factors of strategic success and the creation of value in the long term, connecting the issue of incentives to performances effectively achieved within the multi-year horizon of reference. It is foreseen that the various types of variable remuneration are subject to claw back mechanisms (full or partial repayment of the variable issued component) in the event of fraudulent behaviour of gross misconduct to the damage of the Company brought about by an employee.